The climate of North Texas with hot summers and frequent droughts can be hard on many plants. Whether you are landscaping your yard or working on a commercial development, you want top performing plant materials that will serve you well over the long run and add a spot of beauty to the landscape. It’s easy to fall in love with a lovely specimen and decide that it’s a shrub or tree you want for your property, but it’s best to consider the North Texas climate as well as your growing conditions before making a selection. This is a quick reference for reliable shrubs and trees that should help you make an informed decision that’s just right for your landscaping purposes. This category includes trees that are smaller in stature as well as shrubs that can get very large and fill the same purpose as a small tree. 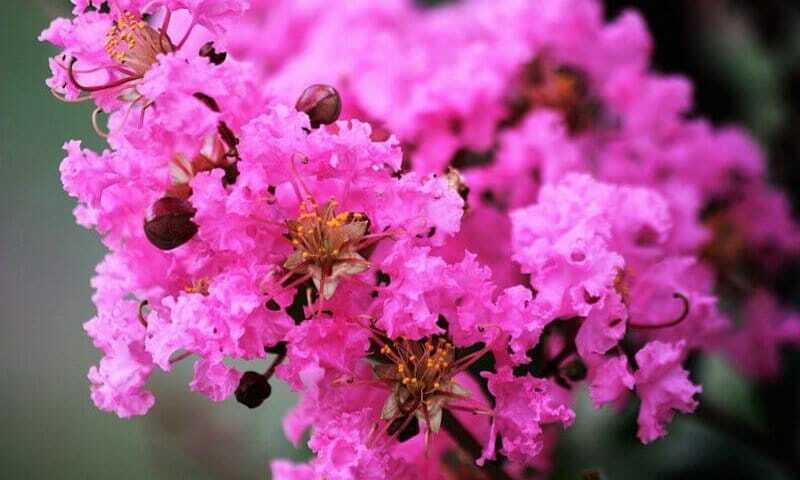 Crape myrtle: These colorful southern favorites offer blooms of red, pink, purple and white with a deep green foliage. They can be in a tree or bush form and certain varieties will grow to be up to 25 feet tall. Smoke tree: This interesting plant produces fuzzy blooms that resemble a large puff of smoke. Common size is around 10’ x 10’. Typically having a dark purple foliage, new varieties now offer more choices including a yellowish-green on new growth. Holly: This plant offers a wide range of shapes and sizes, most being evergreen. Solid performers include Oakland and Yaupon. All hollies have dark green, dense leaves that may have a bit of a spikey tip. Female plants produce plentiful red berries for the holiday season. Japanese maple: For those areas that have morning sun or dappled shade, this maple comes in many colorful shapes and sizes. Leaf shape, textured form and fall color will make this a stand-out in any landscape. Texas mountain laurel: Growing to around 15’, this is a fragrant tree with early season blooms. Will flourish is a dry raised bed. Eastern red cedar: This native plant is as hardy as they come. Line them up in a dry, ignored area and they will reward you with a sturdy evergreen shrub. Because they are native they do well in the North Texas climate with little attention. Abelia: The Kaleidoscope variety is a smaller stature plant with beautiful variegated leaves. Though they will tolerate light shade, you will get the best color when you plant these in full sun. Juniper: This evergreen offers a wonderful assortment of shape and sizes and produces needle like leaves. Most common varieties have the familiar columnar shape but the carpeting types make an interesting ground cover that can fall over retaining walls producing complex and interesting texture. Native sage: Thriving in North Texas climate, this large shrub blooms from late spring throughout summer. If you have a dry, sunny area, this will serve you well. Nandina: Great, rugged plants. They range in size from a short 18” to a showy 6’. If you are looking for a specimen that offers lovely red colors in fall, this is a good choice. Yews: Often considered a bit boring, don’t discount this shrub. You have choices that are upright or spreading that will retain vibrant green color through four seasons. Boxwood: So versatile with many varieties to choose from. A hardy evergreen that will do well in shade or morning sun. Plant single specimens or put several in a row for a lovely hedge or border. Hydrangea: Maybe the most popular old fashioned shade plant that now offers new hybrids that will bloom all summer and tolerate a bit more sun. Average size is about 3’ x 4’ with large, bright green foliage. The pH of your soil will determine if the blooms are pink or blue; you can change color with soil admendments. Osmanthus: Known traditionally as the “tea olive”, this plant is elegantly tall and fragrant. Or choose the dwarf variety which will stay a compact 3’ x 3’. It will do best with some sun and offers yellowish variegated leaves. Ferns: Yes, this is a perennial not a shrub, but many varieties can grow to be as large as a shrub…and they thrive in shade. One of the best features of ferns is the interesting feathered texture they will add to your landscape. And there’s not much more captivating than fiddleheads in the spring. While this is not a complete list of top performing shrubs and small trees, it certainly is a solid start for your landscape planning. If you think you’d like more choices, work with a landscape professional who can guide you on the best options for your particular project.